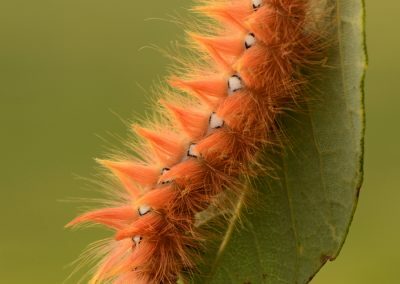 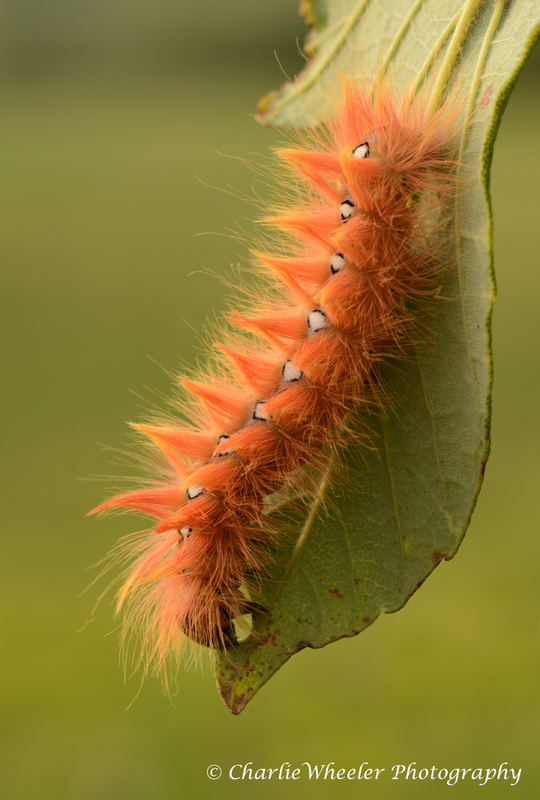 The Sycamore caterpillar, as its name suggests, is commonly seen on Sycamore trees/leaves, but also feeds on Horse-chestnut and Field Maple. 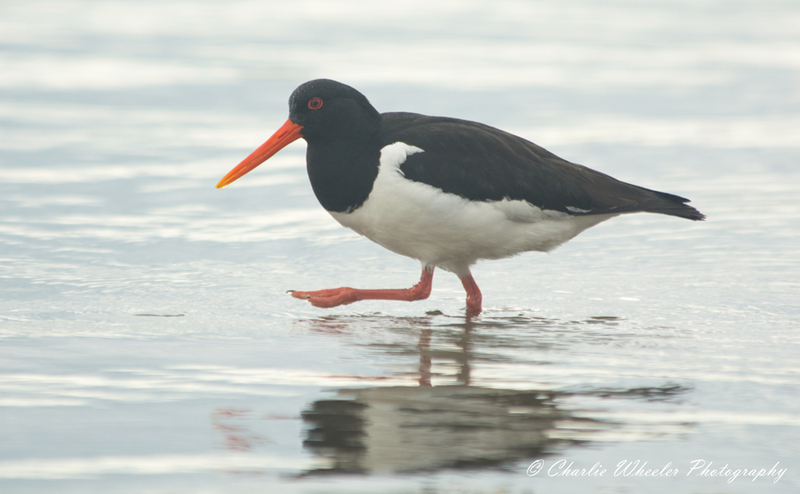 A member of the Wader family, the Oystercatcher is a very distinctive breeding bird that can be seen along the entire length of the reserve, from Abbotsbury to Ferrybridge. 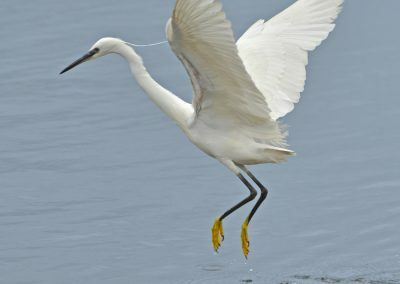 When at rest the Heron is an inconspicuous bird along the shorelines of the Fleet but becomes more obvious in flight due to its size. 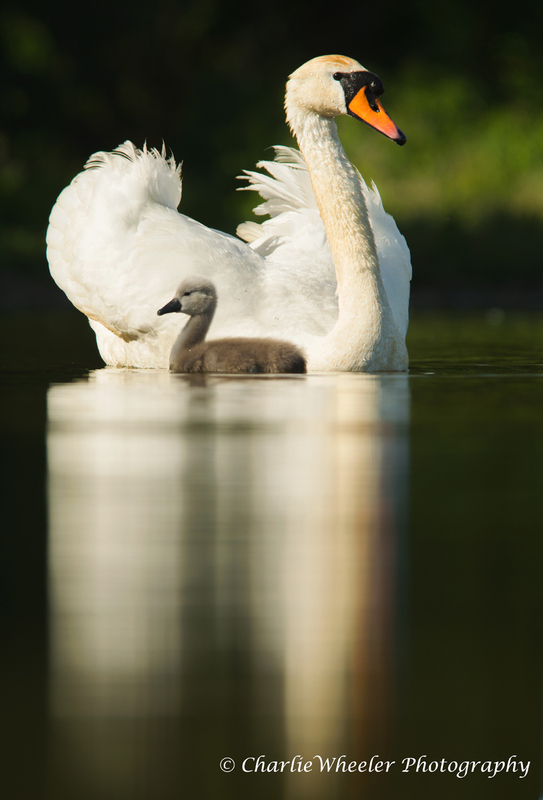 In July, the cygnets are reaching 6-10 weeks old and are growing fast. 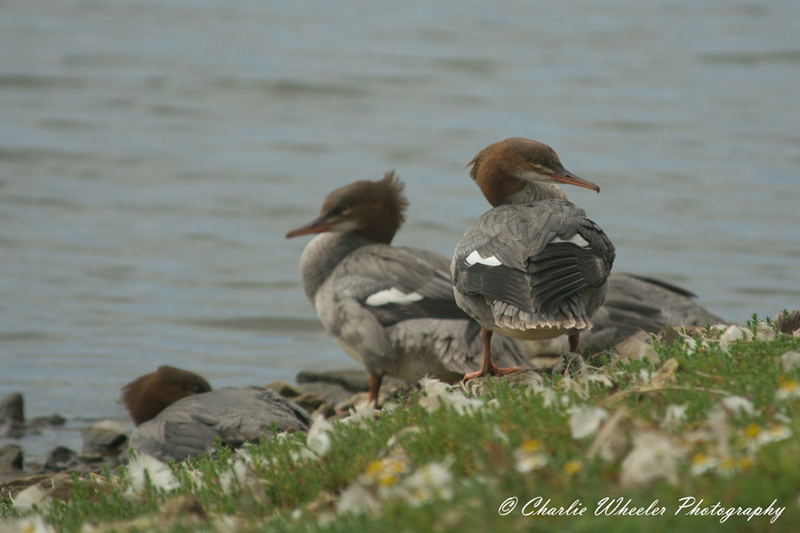 By October the cygnets will be the same size as the pen and ready to fly. 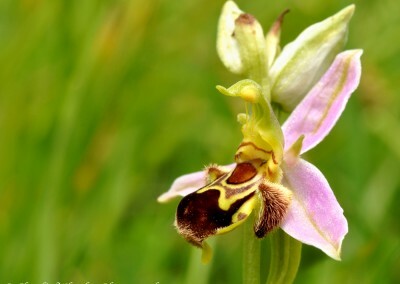 Thought to have got its name from the caterpillars habit of drinking dew from grass stems. 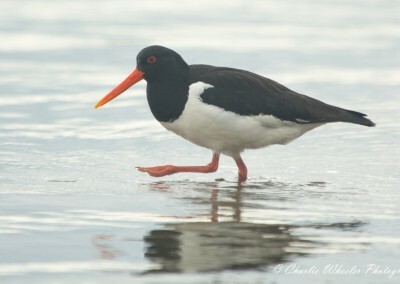 Being part of the coastline the temperature needs to drop considerably for a frost to set on the pebbles. 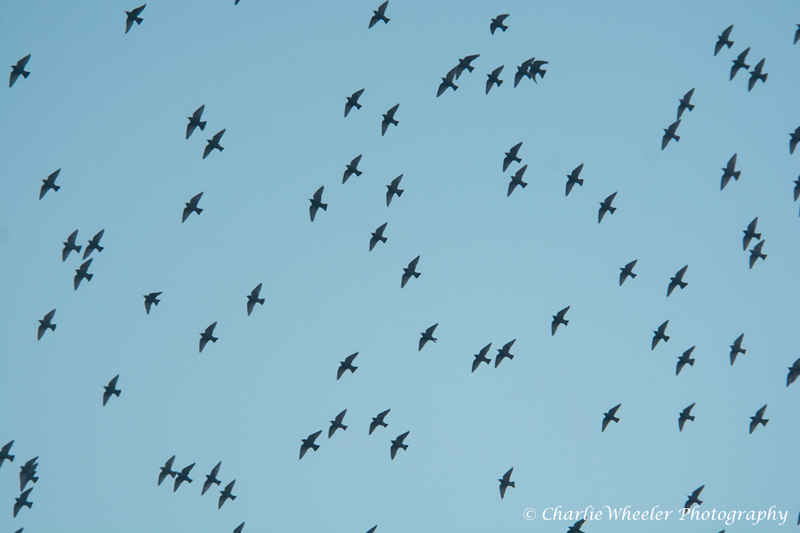 With milder winters, scences like this are few and far between. 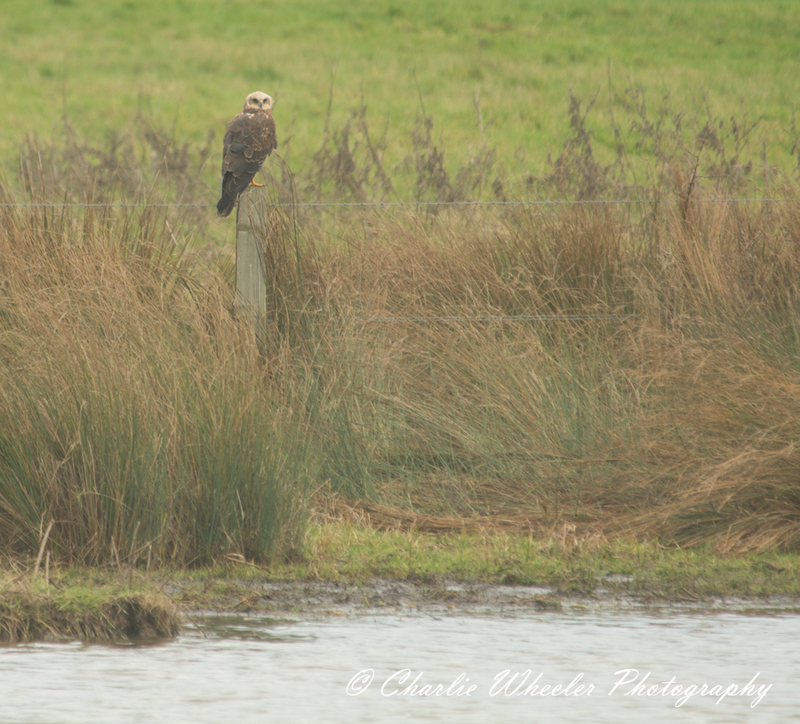 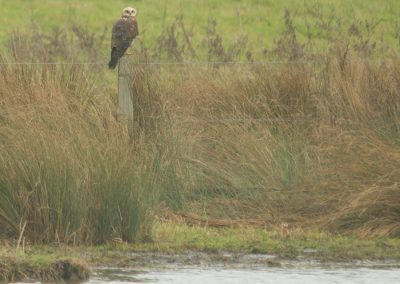 The Marsh Harrier is the largest harrier found in the UK and are notably a reed bed specialist. 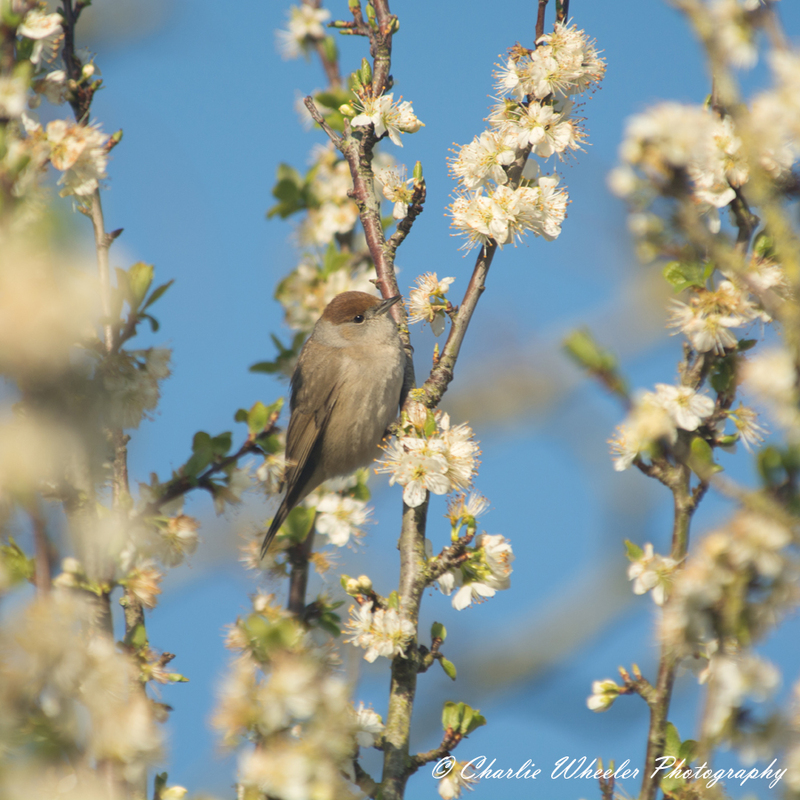 The Blackcap is primarily a summer visitor to the UK and are a distinctive greyish warbler. 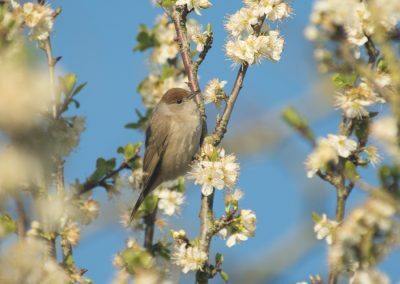 The male has the black cap, whilst the female has the chestnut one. 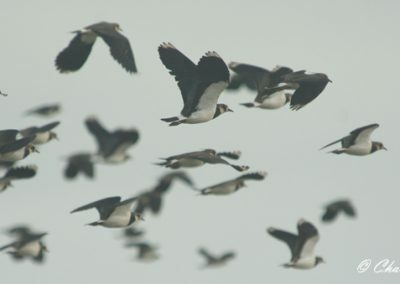 The Lapwing is one of our largest waders, roughly the same size as a pigeon, and is also known as the Peewit, after it’s call. 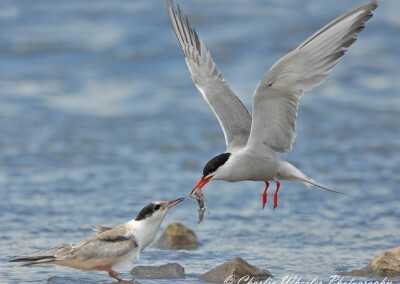 Common Terns nest on an island at Abbotsbury. 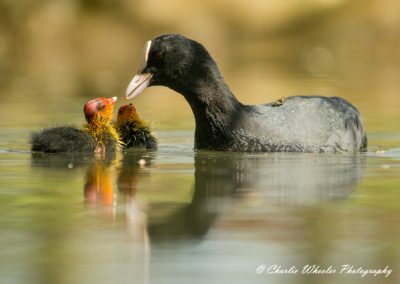 This fledged chick is bathing. 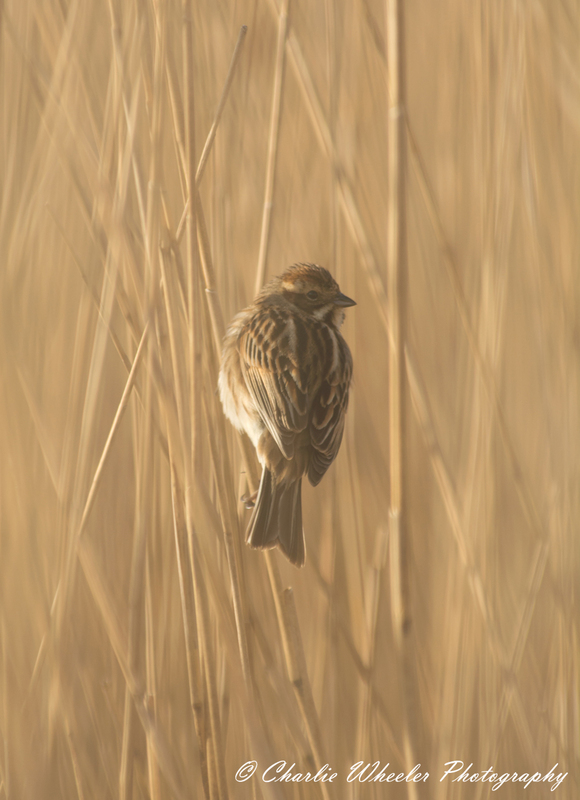 Amongst the reed beds scattered along the reserve, Reed Buntings can be both seen and heard. 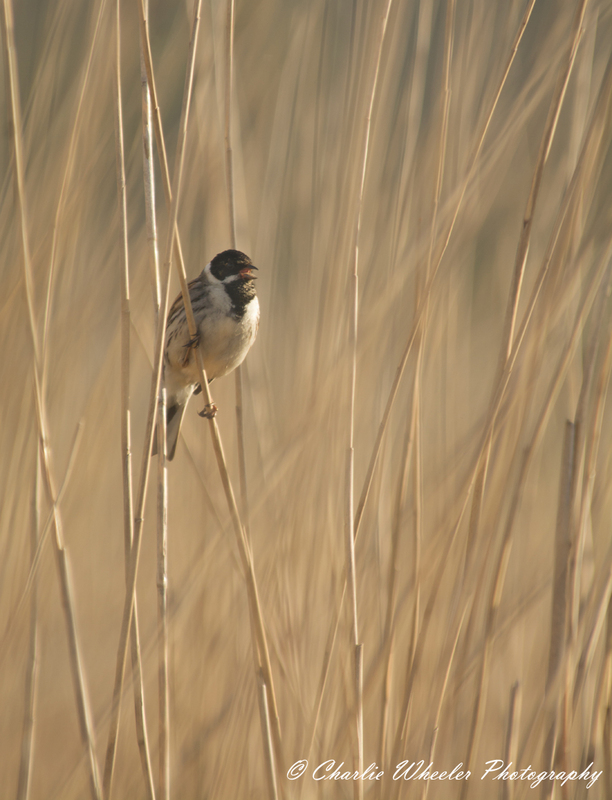 This female is perched near the top of the reed. 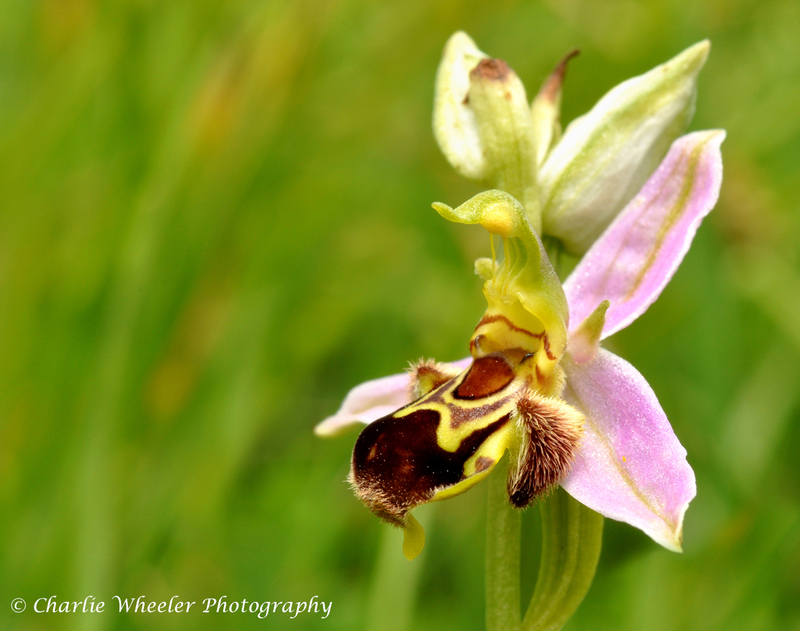 The Bee Orchid is fairly common on chalk grasslands, both by the sea and inland. 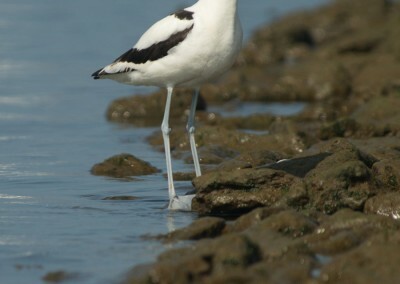 They have been recorded at a hundful of sites along the Fleet hinterland. 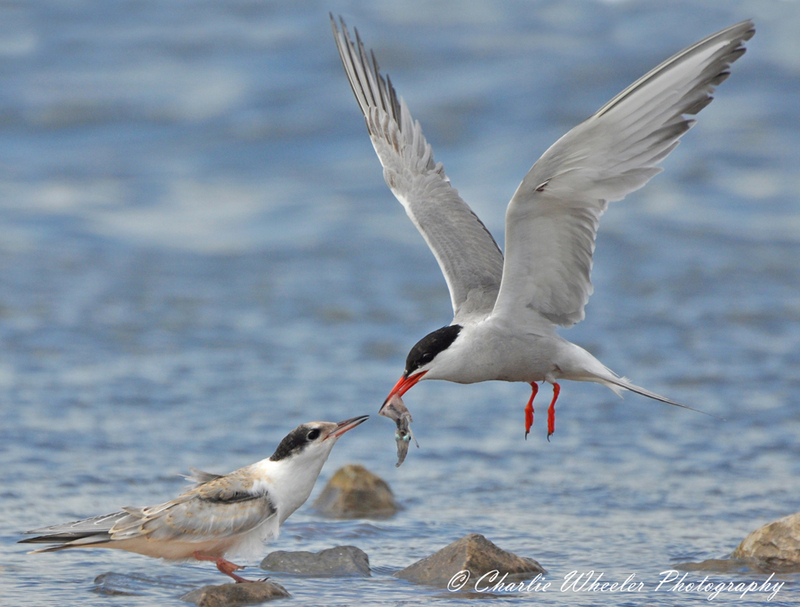 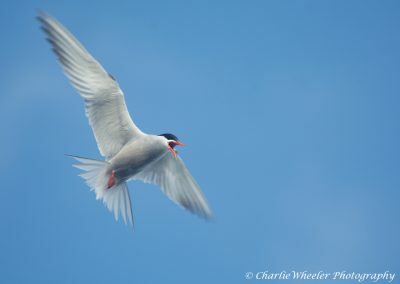 Our Common Terns at Abbotsbury make the long journey every year to breed, coming all the way from the coasts of Africa. 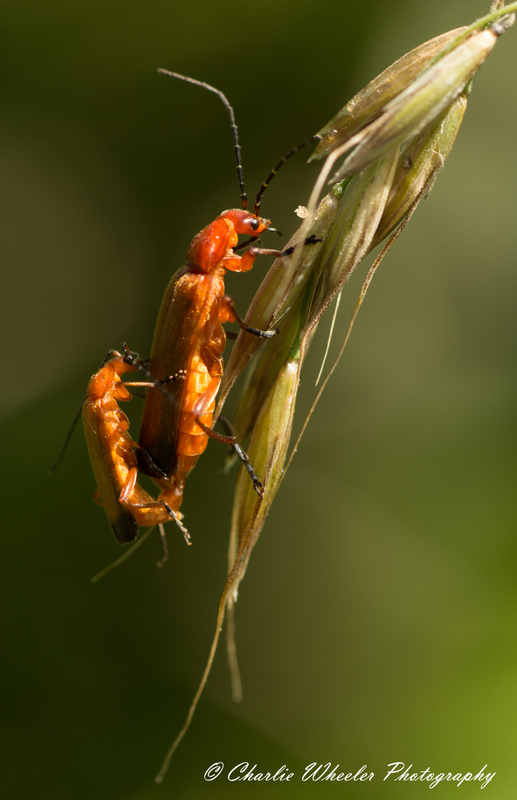 The Common Red Soldier Beetle is also known as the ‘Bloodsucker’ for its striking red appearance, but it is harmless to humans. 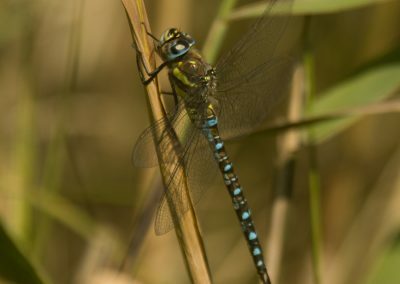 The mating pair were spotted on a grass seed head, where the obvious size difference is clear to see. The Starling is a beautiful bird when seen up close, with glossy feathers of purples and greens. 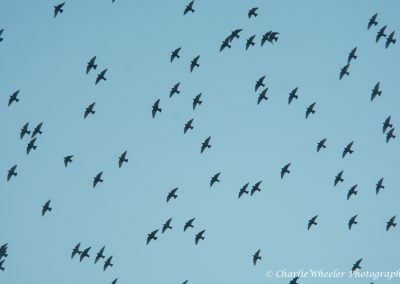 Recognised mainly for their stunning flight displays known as a ‘murmuration’. 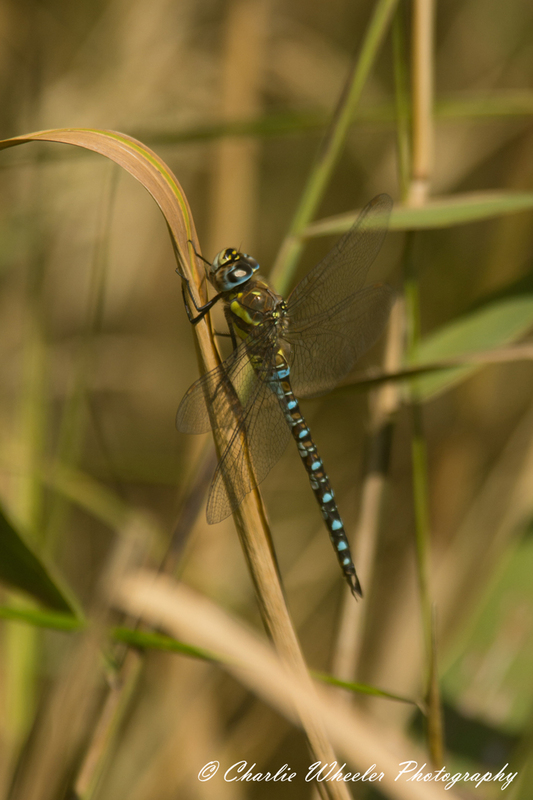 This small Hawker can be seen flying into late Autumn and is likely to be the only Hawker found in November. 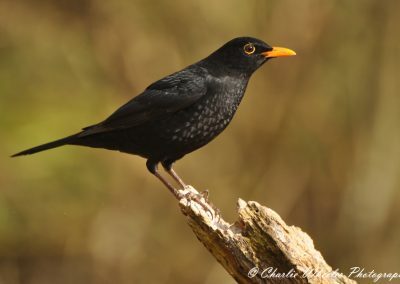 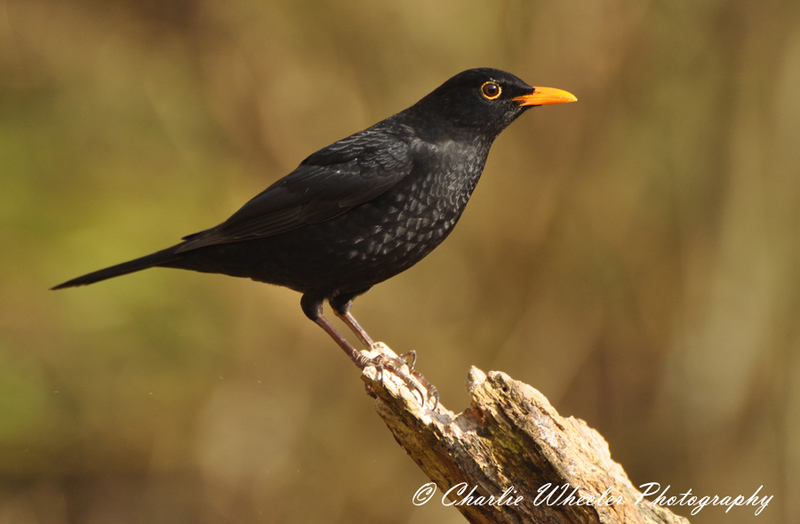 One of our most common breeding ‘garden’ birds, the Blackbird, is one of many that nest along the hinterland of the Fleet. 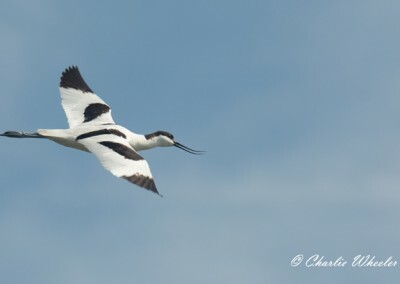 Despite being relatively uncommon on the Fleet, a few Avocet are still seen annually. 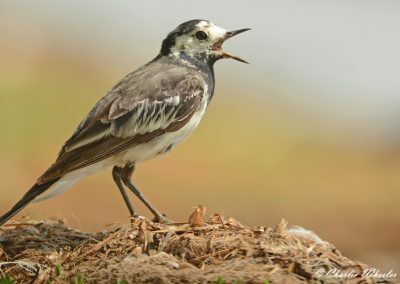 Wagtails, as their name suggests, ‘wag’ their tail up and down when standing still and can also be identified by their characteristic undulated flight. 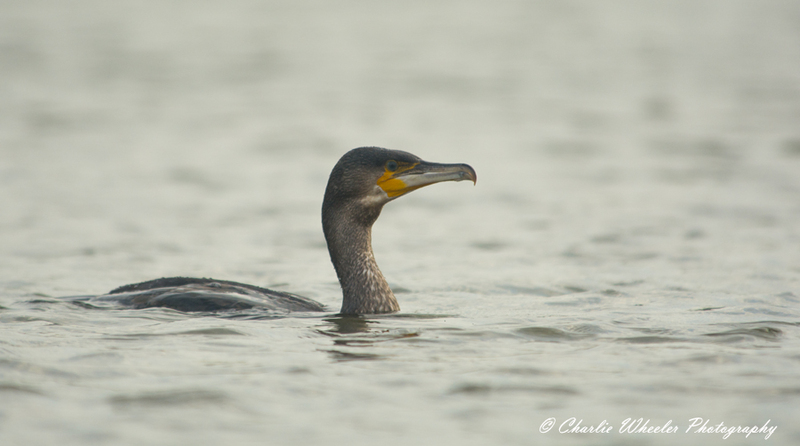 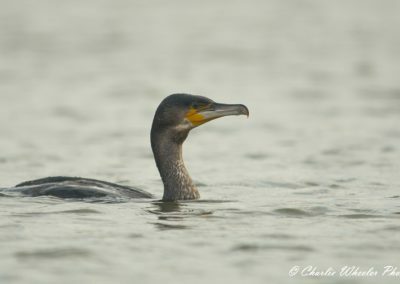 Cormorants are a common sight along the entire length of the lagoon, either seen flying, swimming or hauled out in their unmistakable ‘outstretched’ pose. 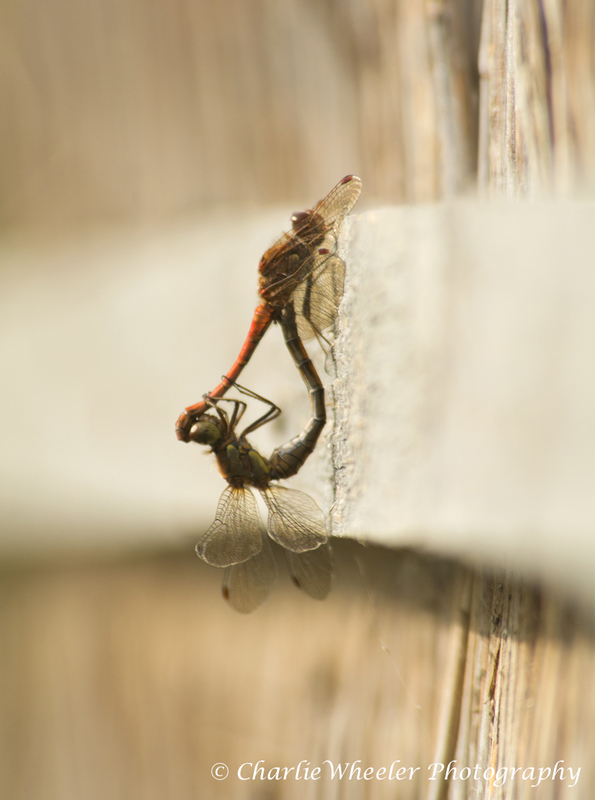 Common Darters, seen here mating, are common throughout the UK. 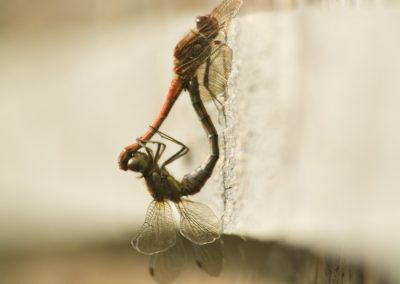 Only mature male Common Darters are red. 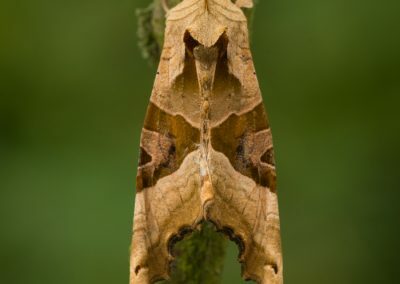 Females and newly-emerged males are a pale greeny-brown. 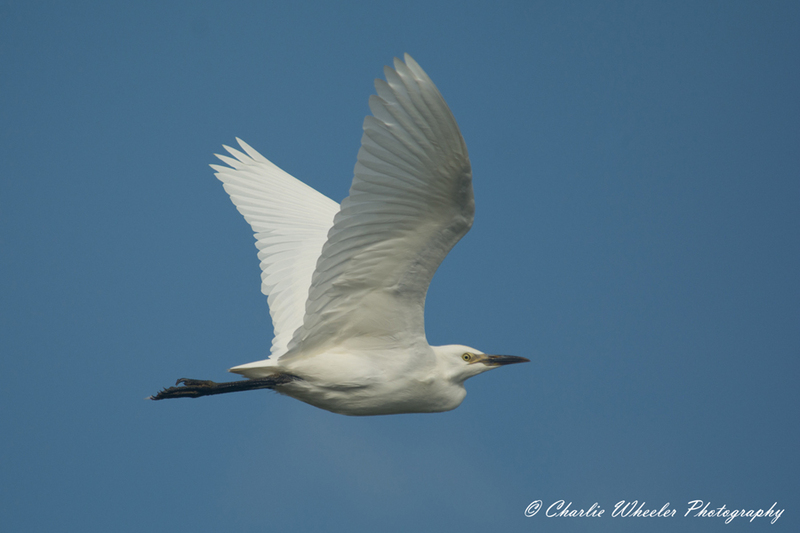 The Little Egret has yellow feet and a black beak, with two long feathers on the nape that form a crest. 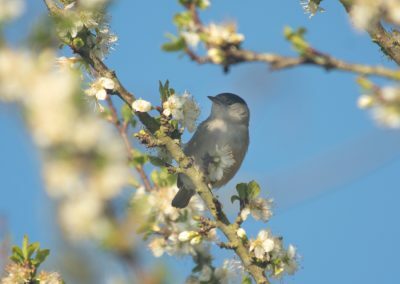 The Blackcap is primarily a summer visitor to the UK and are a distinctive greyish warbler. 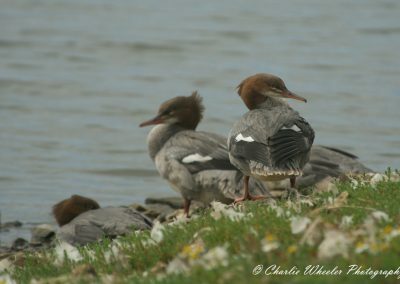 The female has a chestnut cap, whilst the male has a black one. 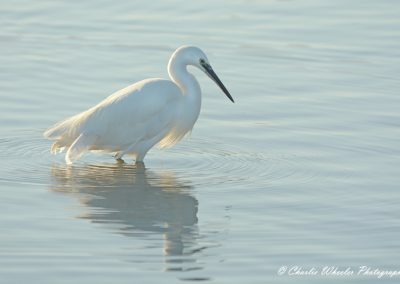 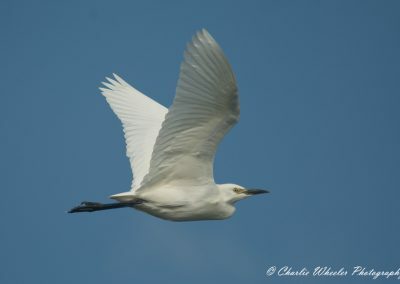 The Little Egret, a member of the Heron family, is a common site along the shorelines of the Fleet lagoon. 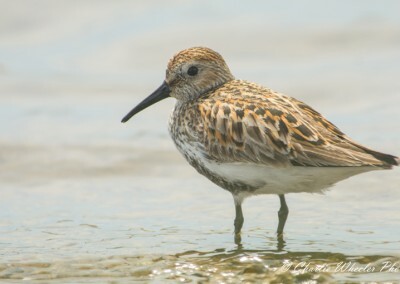 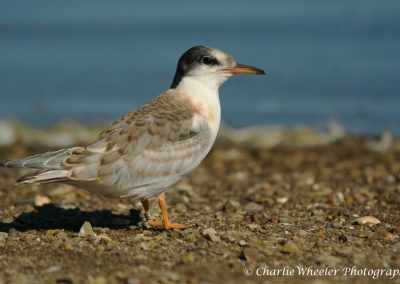 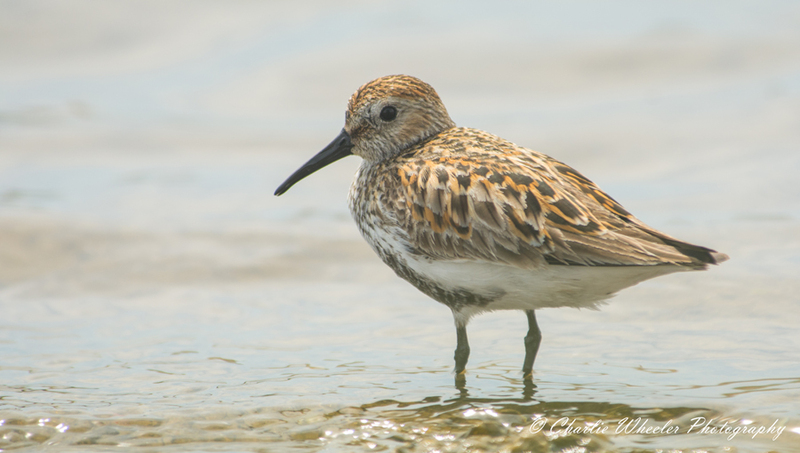 A common wader seen along the shorelines of the Fleet. 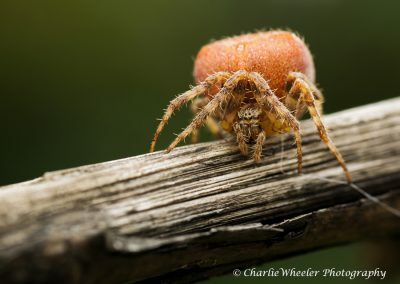 The Four-spot Orb Weaver spider. 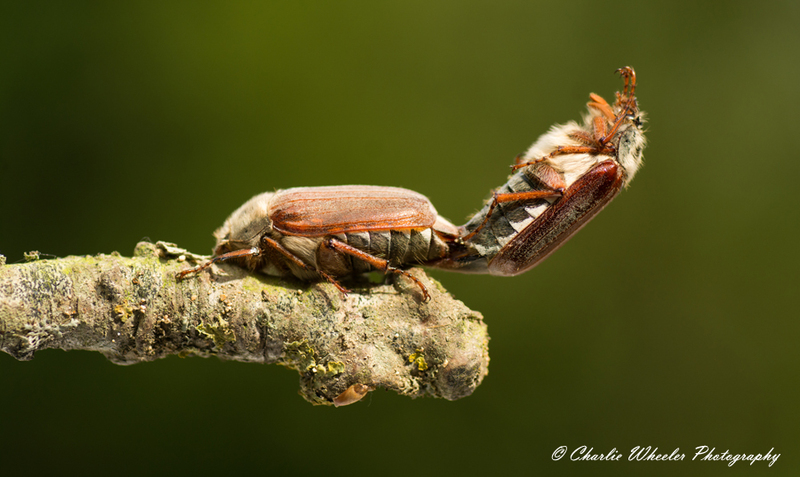 The species builds its web close to the ground to catch jumping insects such as grasshoppers. 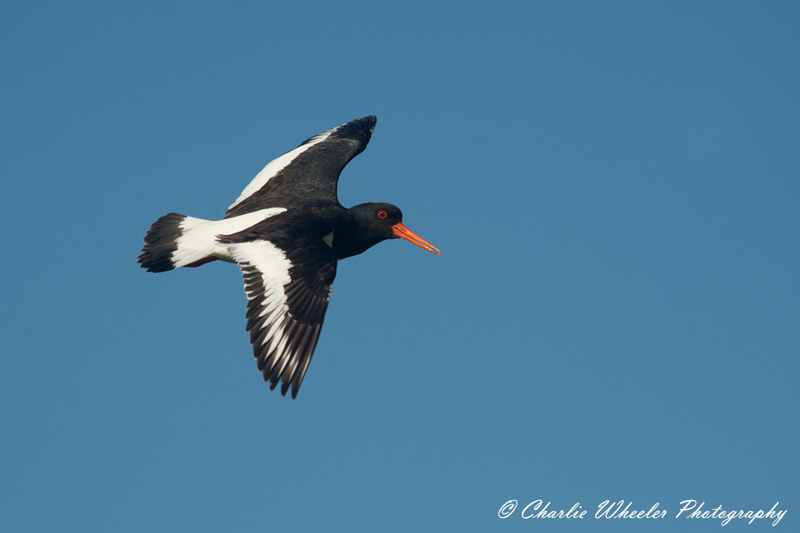 A handful of Oystercatchers nest along Chesil Beach but most chose the extreme ends of the reserve. 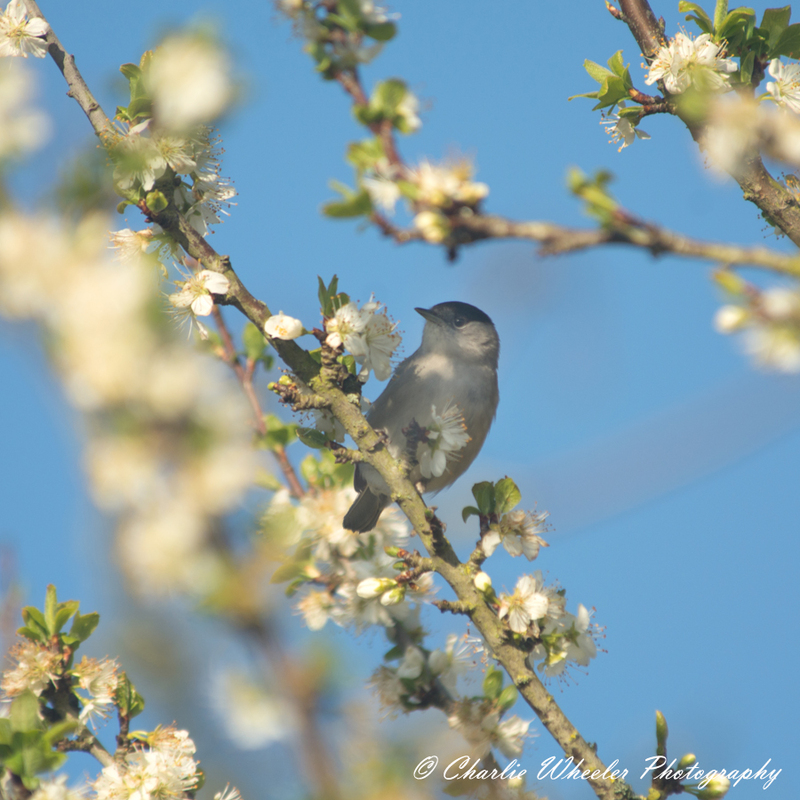 Male Common Whitethroat. 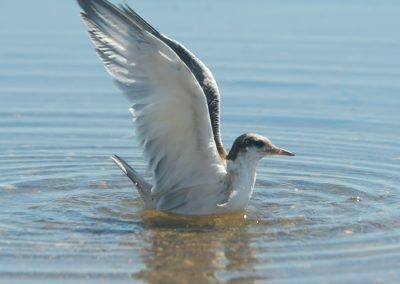 This migratory species has come from the Sahel at the south of the Sahara. 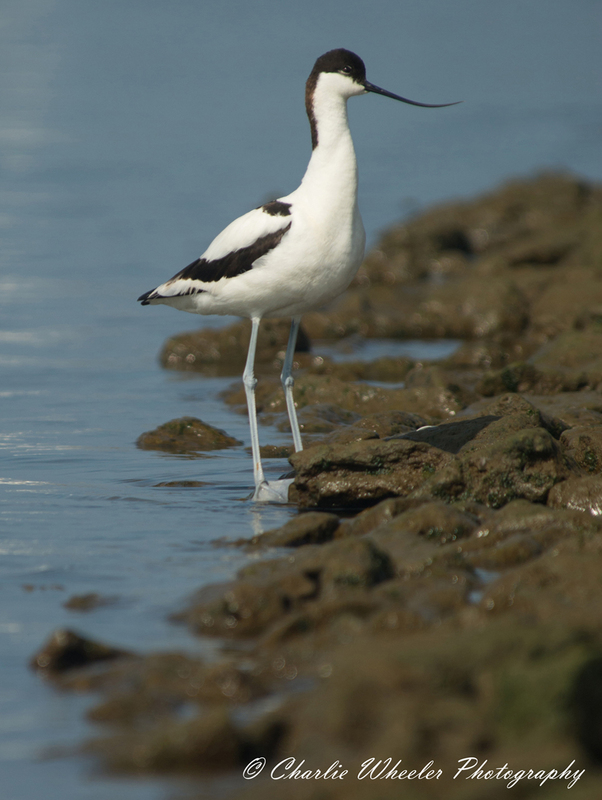 Despite recolonising much of Britain after the Second World War the Avocet is still a relatively uncommon visitor to the Fleet. 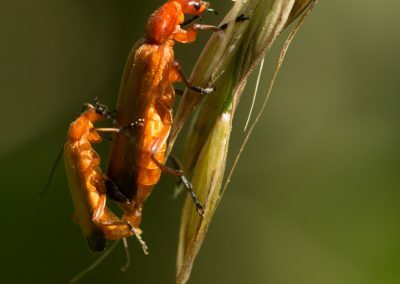 A pair of Cockchafers or May Bugs seen mating here. 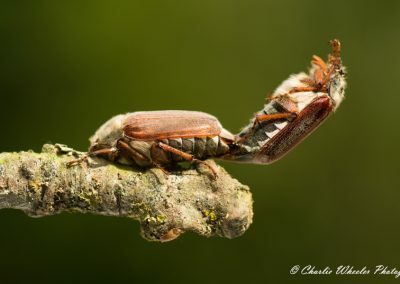 As the latter name suggests, this beetle can be seen from May to July. 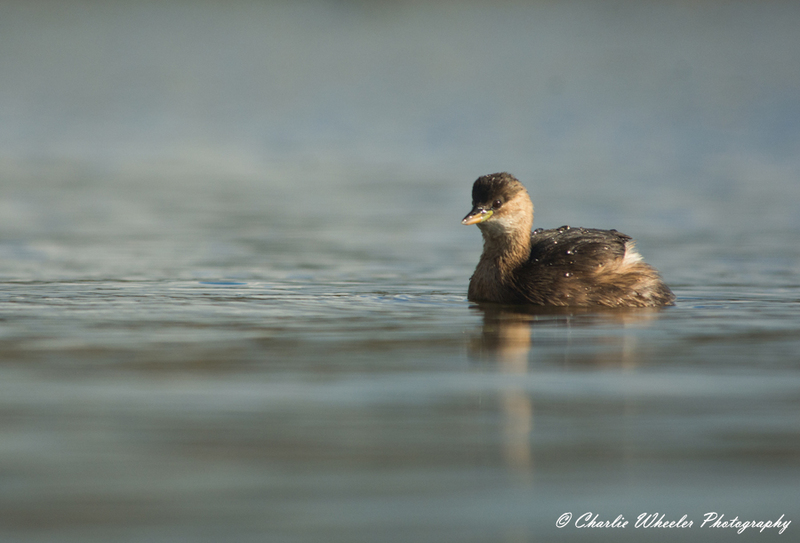 This handsome diving duck is a wonderful sight on the Reserve. 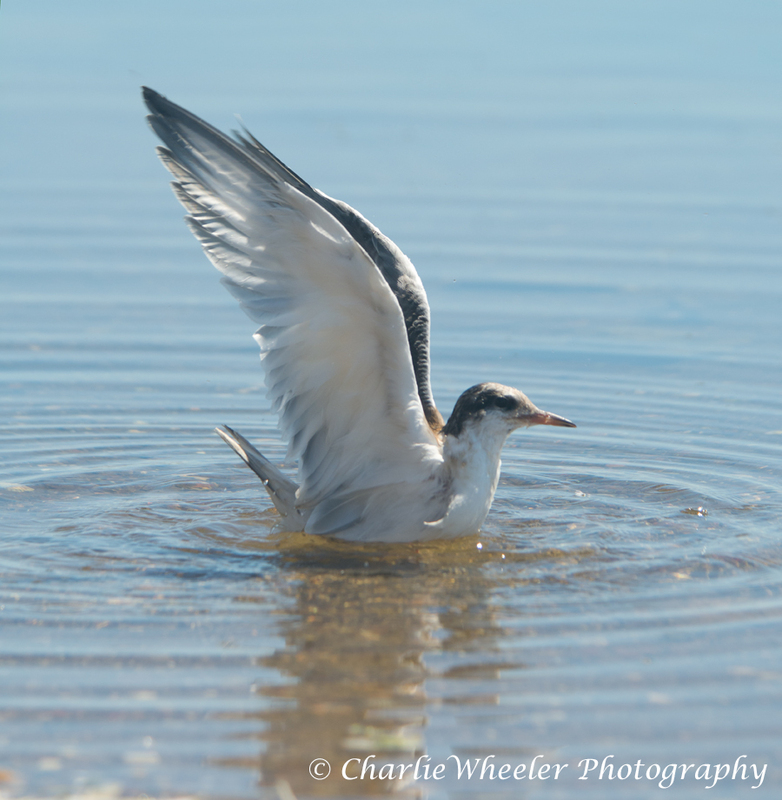 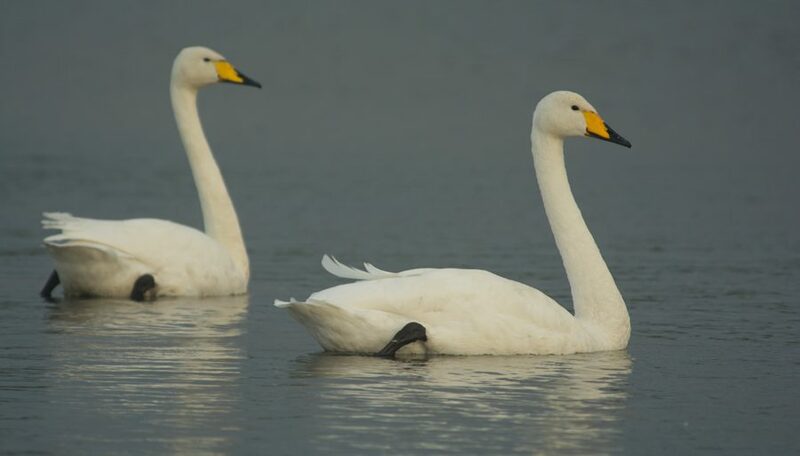 They are member of the sawbill family, so called because of their long, serrated bills, used for catching fish. Coots are a common site on the Fleet, with a considerable number nesting within the Swannery. 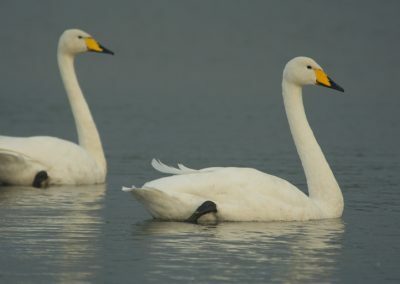 Each pair can have numerous clutches throughout a season. 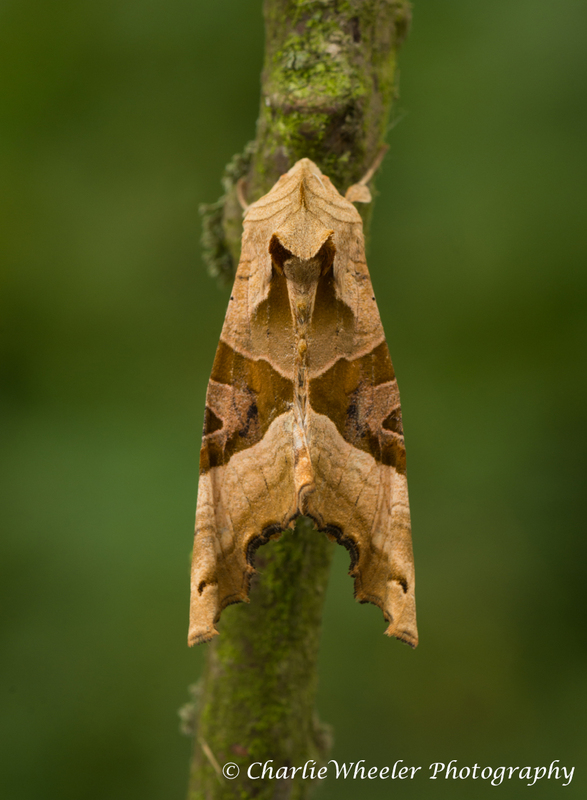 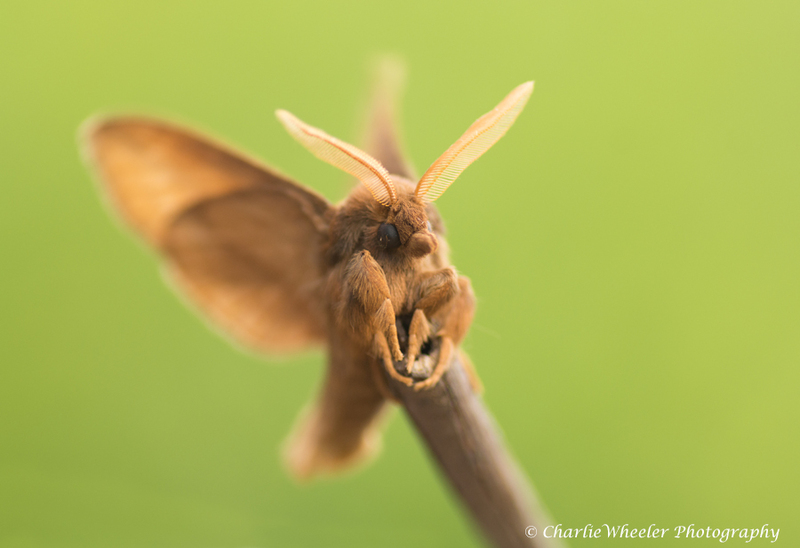 This highly distinctive moth, rests with its wings folded back, looking like a withered autumn leaf. 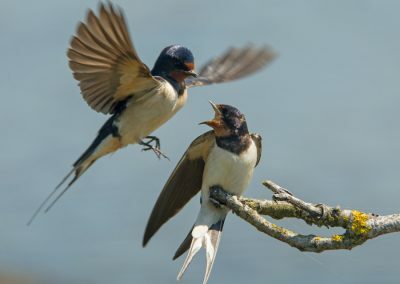 Adults will fly between May and October. 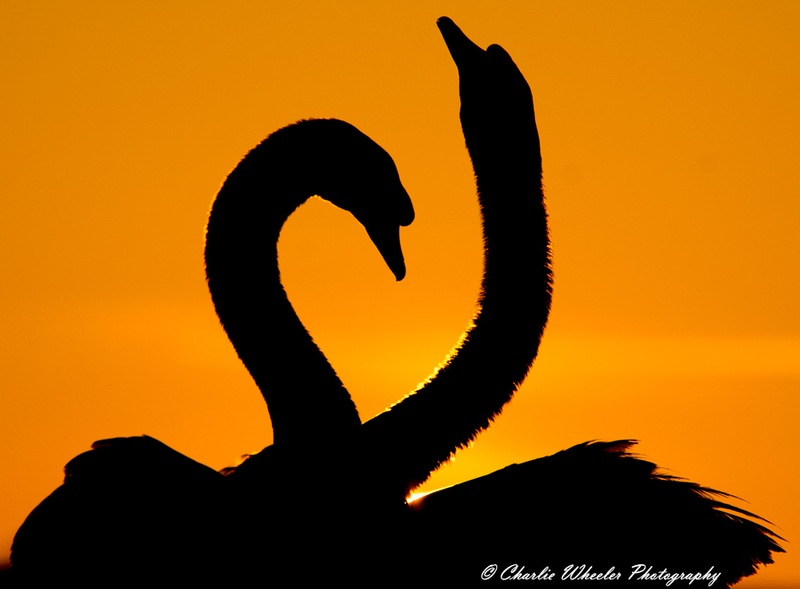 Mute swans go through their courtship at the beginning of the year. 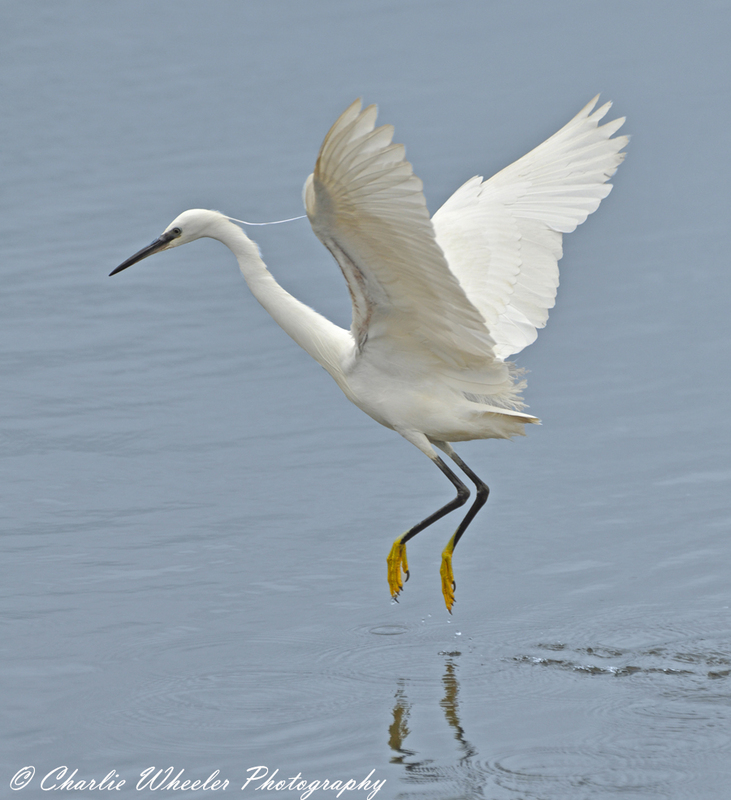 This classic pose is a common site…and sound. 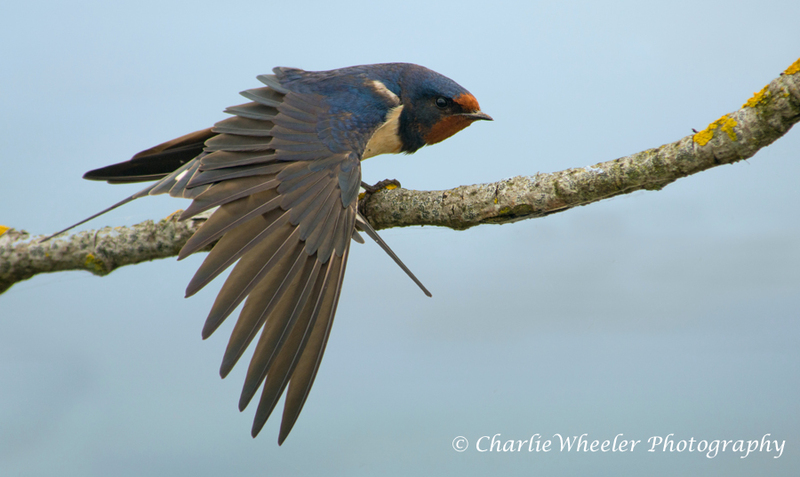 The beautiful colours on a swallows back, wing and face is quite astounding. 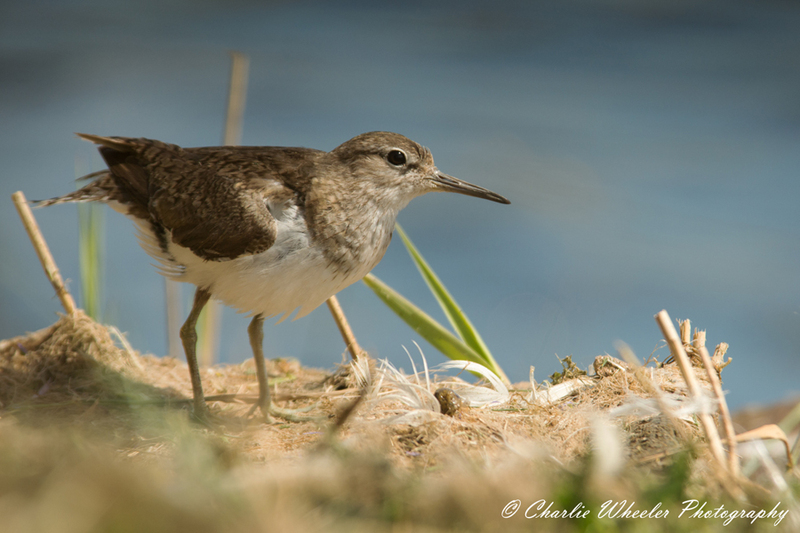 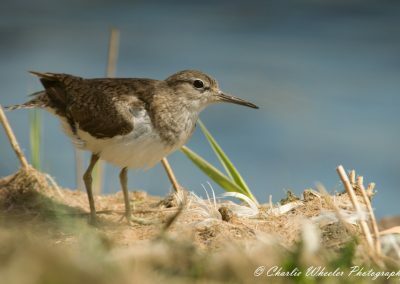 The Common Sandpiper is a small wading bird, regularly seen on the reserve. 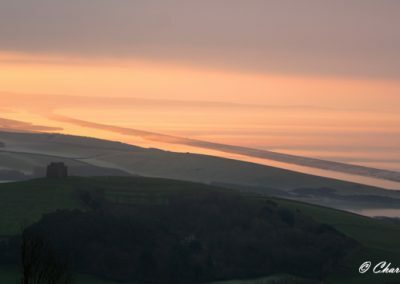 View looking west over the Chesil Bank and Fleet Nature Reserve. 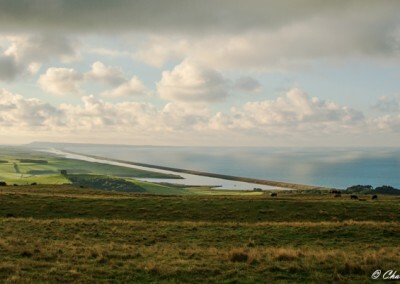 A famous view seen from the top of Abbotsbury Hill, with the island of Portland in the background. 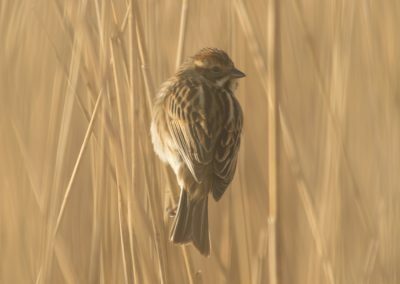 Amongst the reed beds scattered along the reserve, Reed Buntings can be both seen and heard. 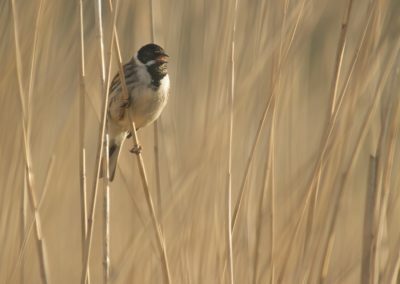 This male is calling near the top of the reed. 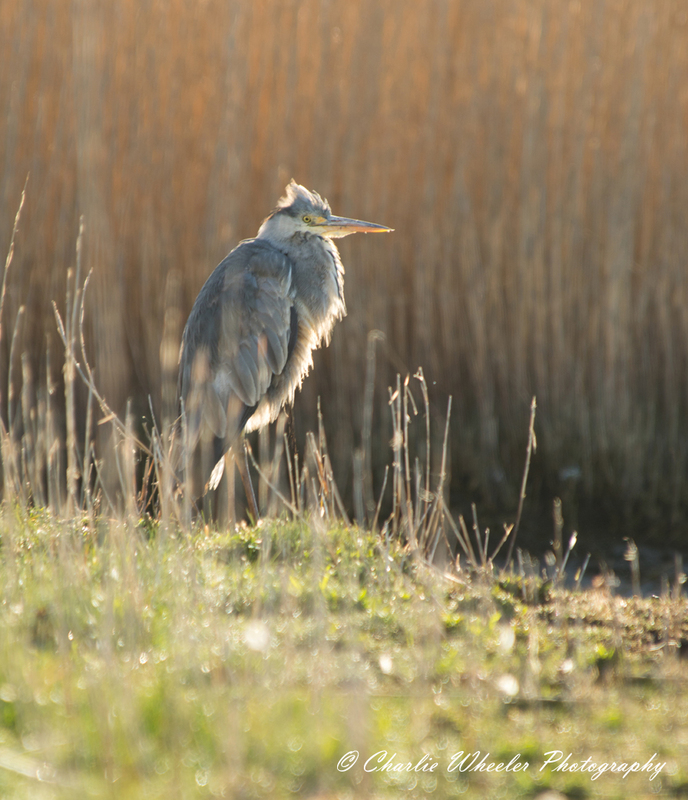 This intriguing member of the Heron family is becoming a more common sight in the UK and even beginning to breed. 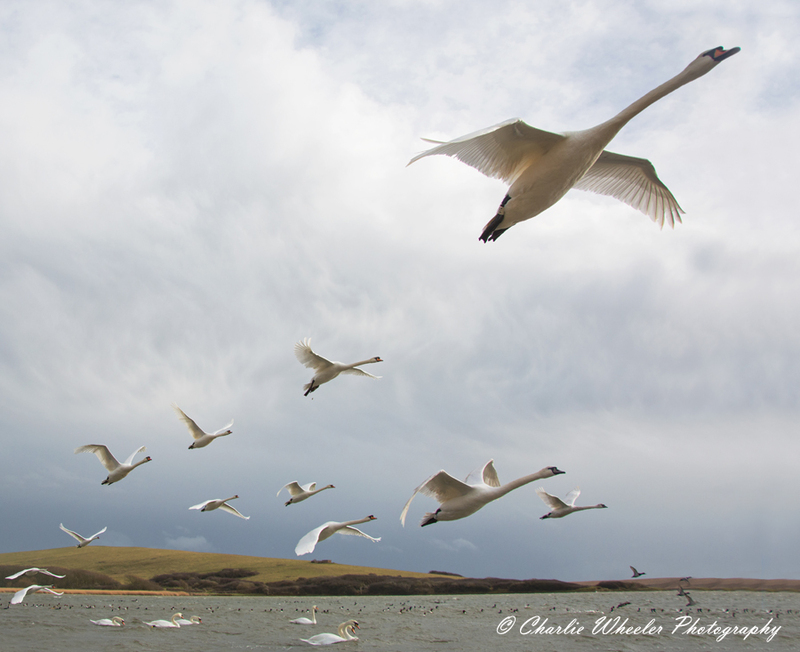 The Swannery at Abbotsbury is the only managed nesting colony of Mute Swans in the World. 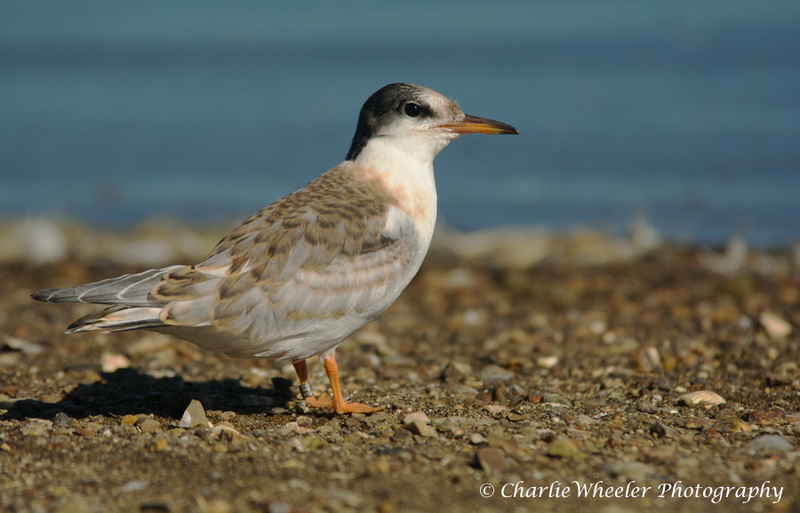 This newly fledged Common Tern chick hatched on the tern island at Abbotsbury and has been ringed. 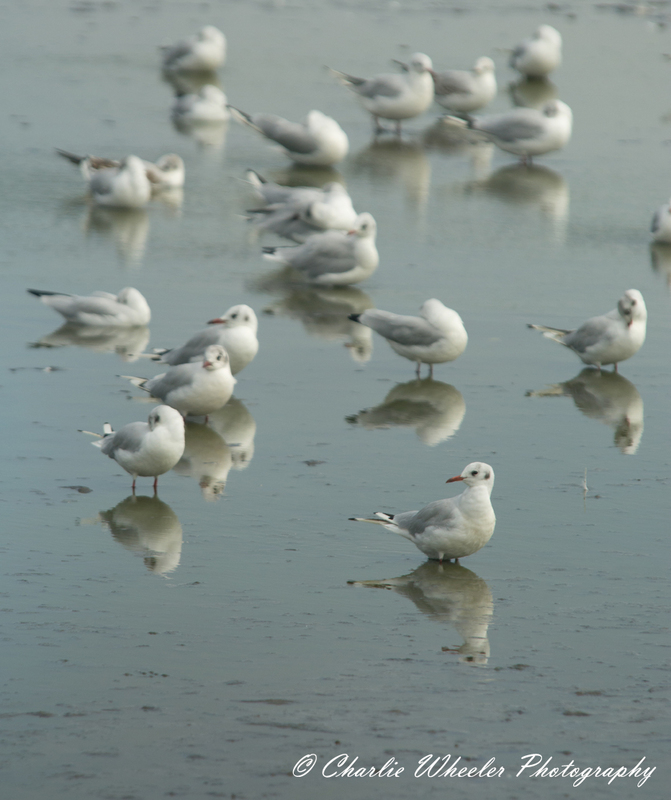 An established Tern colony nest at Abbotsbury Swannery every year. The smallest of the British grebes, a regular non-breeding bird on the Fleet. 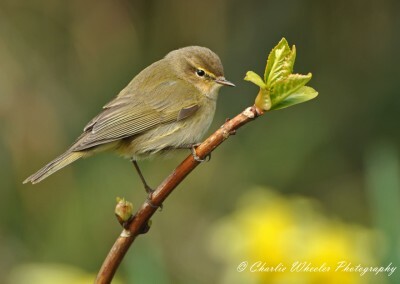 A small warbler that can be found in suitable habitat on the foreshore of the Fleet. 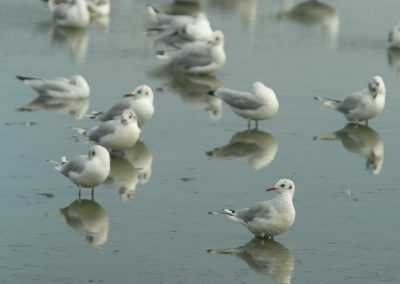 One of teh reserves most common gull, the Black-headed gull with numbers soring in the winter months. 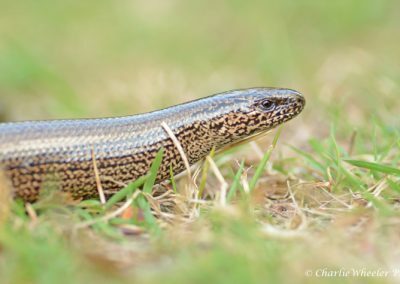 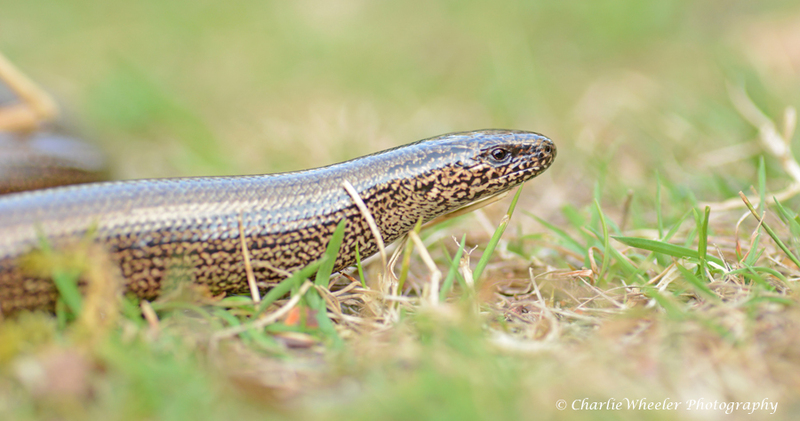 Despite their name and appearance, Slow-worms are neither snakes or worms or are even particularly slow, they are in fact legless lizards! 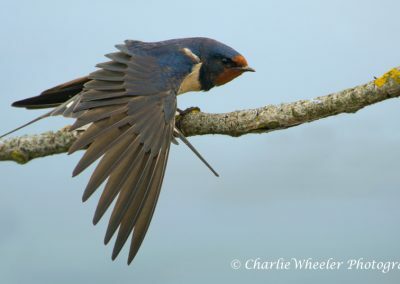 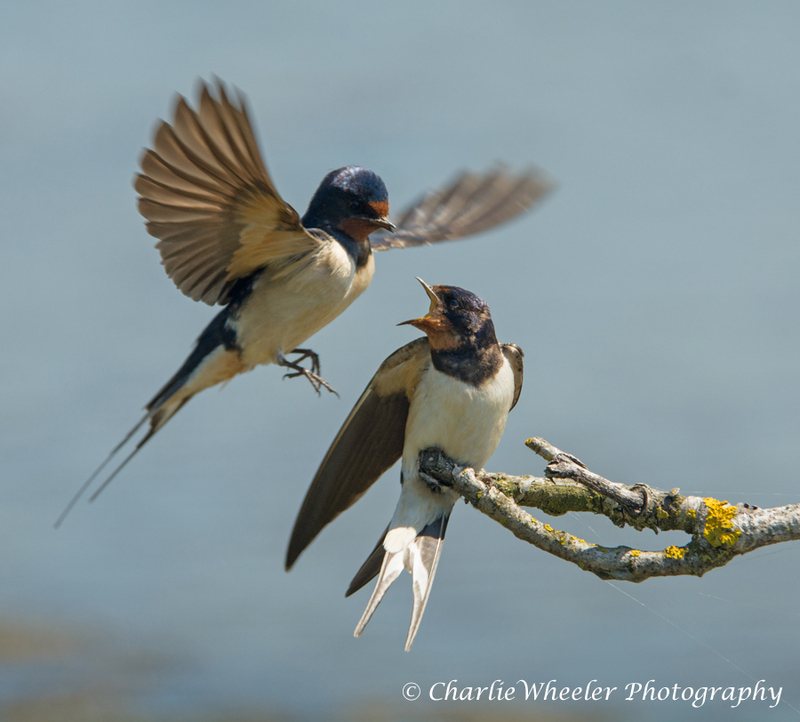 Pairs of Barn Swallows often nest in the outlying hides at the Swannery, as well as lots of other buildings along the Fleet. 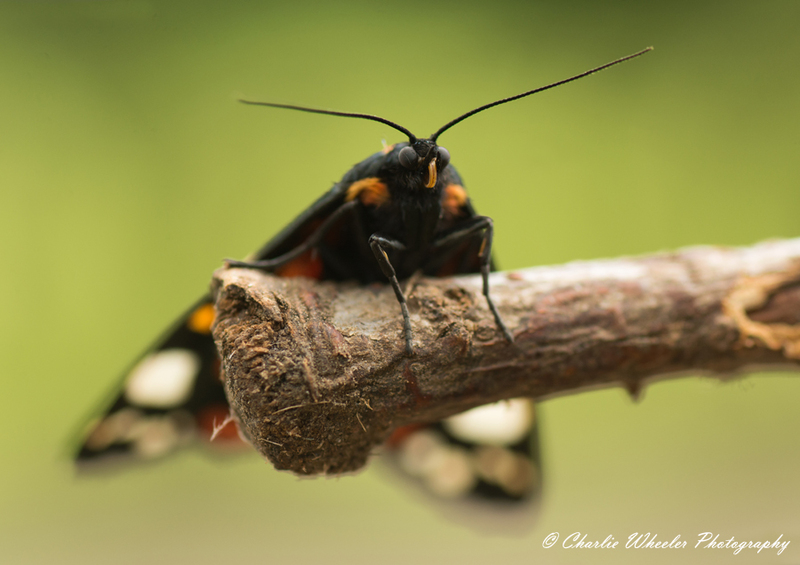 Once a common and numerous species at certain areas of the reserve, the striking Scarlet Tiger moth is no longer seen in such numbers. 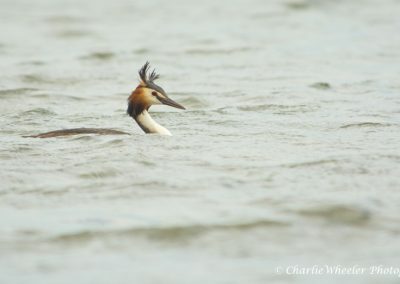 This elegant member of the Grebe family can be seen regulalry on the Fleet, usually at a distance. 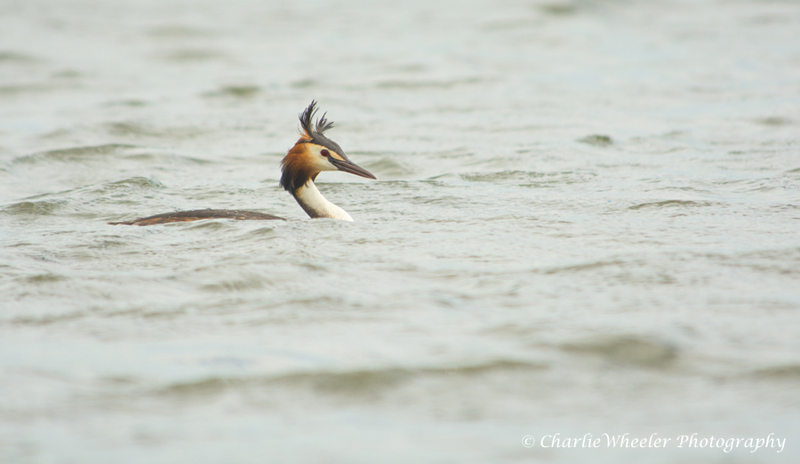 Grebes, like other diving waterbirds, have their feet set back on their bodies to aid them swimming underwater. 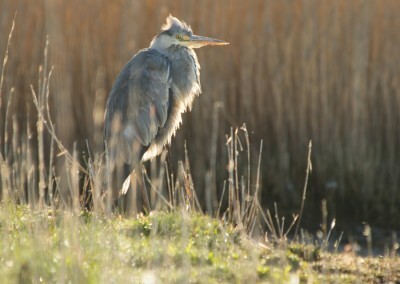 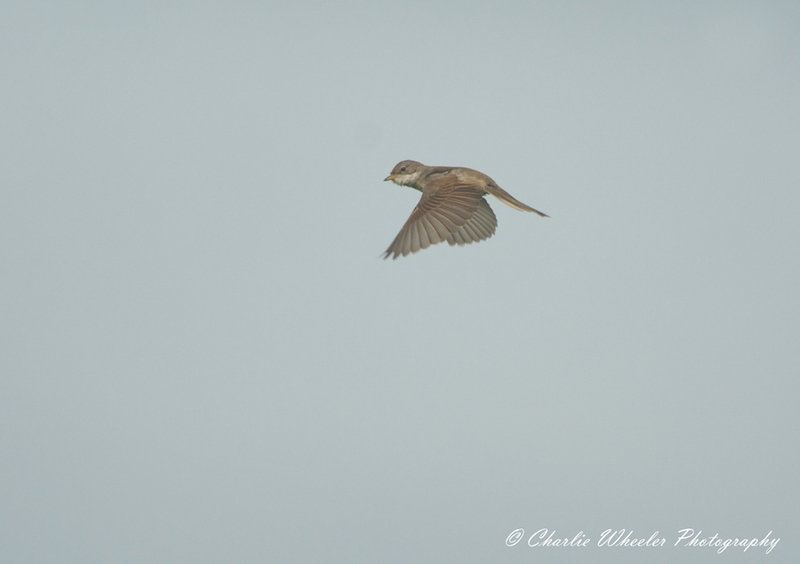 A scarce winter visitor to Dorset and the Fleet. 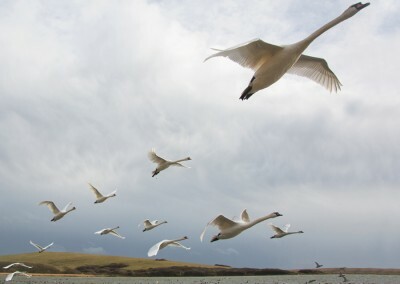 Whooper swans migrate South from their breeding grounds in Iceland (as most British wintering birds originate, although a few may come from Scandinavia). 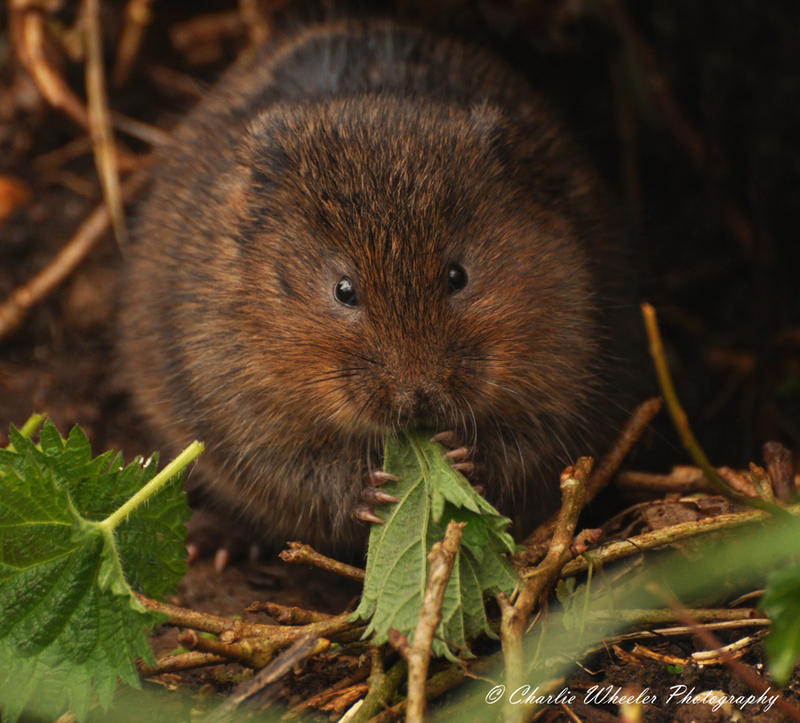 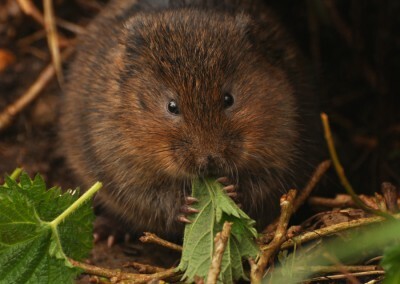 Slowly increasing in numbers, Water Vole reside in the tributaries along the Fleet. 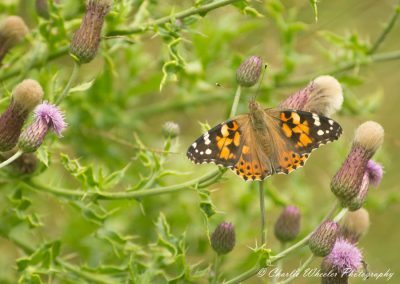 This particular species of butterfly is quite common along the Fleet hinterland. 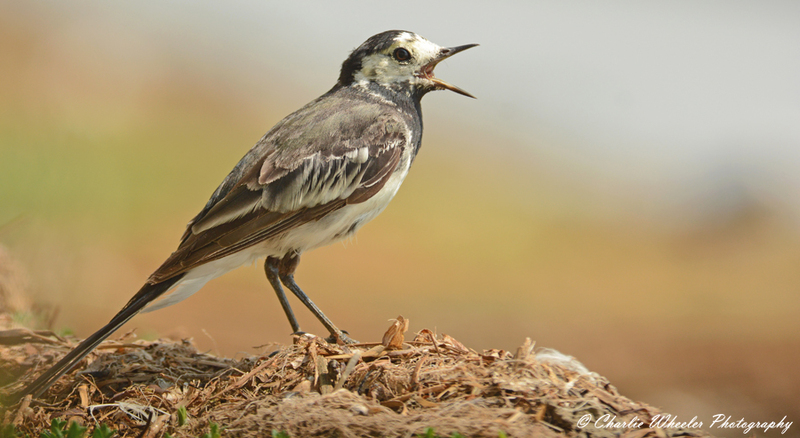 It is a migrant to our shores, all the way from Africa.